This adorable apartment is in the heart of San Telmo, on Plaza Dorrego, where every weekend there is a flea market and Tango shows. The apartment is located in a typical Colonial building and is reached by following a long corridor and marble staircase (no lift available). As it is deep within the building, there is no noise from the street. However, it does get plenty of natural light. Recently, it was completely remodeled, conserving the original structure and craftsmanship. The exposed brick high ceilings, wooden floors, doors, windows and several antique details are all original and like new. The apartment has one bedroom with a double bed located in a loft. There is also a large comfortable living room and the bathroom, with bidet and bathtub, and kitchen are fully equipped. If you want authentic atmosphere rather than an antiseptic hotel, then this is what we offer. Please, ask for the prices in the week of Christmas and New Year. We enjoyed the roominess, convenience and comfort of the apartment and appreciated the security of the building, along with the proximity to Plaza Dorrego and the shops and services of San Telmo. When we had a problem with the oven, the keys or the internet, it was dealt with quickly. On the one day that we used the air conditioning, it worked easily and well. We cooked often and the kitchen had enough equipment for that, but some of the pots could be replaced. One of us drinks tea and had to be resourceful in making it, so a teapot and/or tea strainer would be nice. The only strong suggestion we'd make is to improve the internet reception. It worked well most of the time, but not all the time. We'd recommend the apartment to anyone who wants to visit Buenos Aires and be independant. We hope to be back! I loved this apartment. this was my sixth stay in buenos aires. it was the first time i was truly comfortable. the apartment has everything you need, except for a good kitchen knife. i always travel with a good knife , since i love to cook. i had several very nice dinner partys there. i loved the location. san telmo is my favorite neighborhood, close to all the milongas i like to dance at. a great fish market right around the corner. my favorite restaurant 'Origen' two blocks away. and on sunday nights, i could just walk out the door and dance in plaza dorrego. my only cons are the stairs. i rented a bicycle and had to haul it up and down the stairs. and when it rains alot , the roof leaks on the main hallway. but i will rent this apartment again next year. The apartment is even nicer than it looks on the photos, which don't fully convey its generous, harmonious proportions and the amount of light - there's an internal corridor running its full length with a wall of windows (looking onto an internal courtyard). Furniture and decoration are simple, comfortable and tasteful and the whole place is very liveable, with the kind of small but important details, like dimmable lighting and lots of well placed hooks, that hotels often fall down on. Worth mentioning that the futon is in a separate room, which gives its occupant some privacy (though the bathroom is through here). We could hear a little bit of tango music and some drumming drifting up from the street at weekends (there's a milonga on Plaza Dorrego on Sunday nights), but it was more atmospheric than loud and didn't go on too late. The flat is a nice, spacious loft right in the center of San Telmo exactly as in the pictures. A perfect place to come back to after a long day exploring Buenos Aires. After a construction side made us leave our first apartment (Casa San Telmo reacted fast and very helpful) we found the perfect apartment with this one. 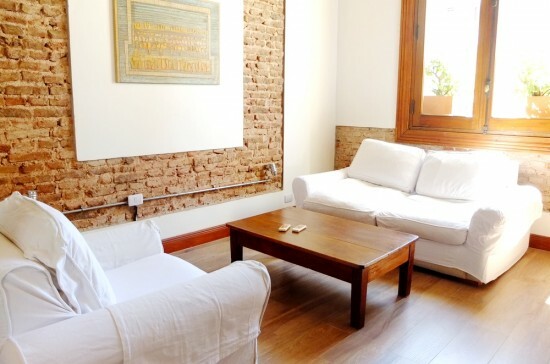 Perfectly located in the heart of San Telmo, beautiful, quiet, nice, fully functional AC, clean, best mattress ever and a fully equipped kitchen! It was a great pleasure to stay there and we would choose this apartment again. Only problem: We loved the apartment so much, we didn't leave enough to visit the city... So we will definitely have to come back. Thanks a lot Casa San Telmo! The apartment is really nice and clean. The location is perfect - in the heart of San Telmo. It is quiet and bright. Communication with the owner was easy and friendly. There was no problem changing the payment method . In case of problems he took care immediately. Also they helped us with problems not concerning the apartment. Apartment No 1 is as described on the homepage; I stayed there for 1 month and I was completely happy. : the very helpful owner, the apartment’s facilities (kitchen, bathroom etc. ); I especially appreciated the plenty of lamps with good light, the typical window-side front (natural air condition) and I liked the background-music of Plaza Dorregos bohemian scenery (very, very little audible in the apartment); --: saying good-bye to Buenos Aires summertime! My experience staying at this apartment has been fantastic! It is the perfect location in the heart of San Telmo but it remains safe and quiet at the same time. What's more, it is fully equipped with everything you could possibly need to enjoy your stay. I have been renting for close to two months now and have been impressed with how quickly the owner responds to any needed repairs/problems that I have. Usually when I contact them, they have the problem solved by the very next day which has been a real bonus. Overall, I would recommend this space to anyone looking for a safe and convenient location, and an all around wonderful experience in one of the more historical neighborhoods of Buenos Aires. Hello Ya\'ll, If I had the space and time, to share all of the qualities of this exceptional abode then I should need to reserve it at least one year in advance(and probably pay double). The apartment,service of staff,location , San Telmo reminds me so much of the French Quarter in New Orleans in the early sixties !!! Art Antiques Music Food Entertainment it\'s all here. A lovely, spacious apartment in a good location. Highly recommended. If you want to be right in the heart of it all, but still have peace and quiet, this is the right choice. We spent 4 weeks in this San Telmo apartment and it was fantastic. The apartment is nice and big and the location is perfect. We couldn't have been happier with the location and the few small problems we had with the apartment were quickly taken care of with a phone call. Thankyou very much for the excellent service. We loved our stay and would recommend it to anyone wanting to enjoy all the delights of San Telmo. We would happily stay again. Sonia. This place was a perfect finish to the end of a 5 week tour across South America.Location location location. It does not get much better than this place, you can hear the soft music float in the large windows from the main plaza across the street.As a travel agent in Australia I would recomend this to all of my customers as a great alternative to a small hotel that would cost around the same. Why have one choclate when you can have the whole box. We rented this apt and the larger one as well in 2009/2010 and were very pleased. Wonderful homes, fabulous location, unbeatable service. I can't say enough good things about the apartment and the service. First of all, the apartment itself was one of the nicest apartments or hotels I've visited in BA in my five trips in the past 18 months. Bright, airy, high ceilings, and a very cool old building with lots of character. The set up was great--it was just me this trip, but it would have worked for a family with kids as well. Kitchen was nicely appointed, and furniture was nice. Most of all, the San Telmo neighborhood is charming and unique, unlike areas like Puerto Madero, Recoleta, or others. When you walk out the door on Sunday morning, the fair is right there. And on Sunday nights, if you have the windows open, you can hear the strains of music where the locals have come to dance in the square. That was one of the highlights of my visit, as i felt like a local. Grocery stores and the market are very close; tons of great restaurants in the area. And from a service standpoint, everything happened as promised, so that made it even nicer. I'm almost reticent to write this, for fear that someone else will be renting the apartment the next time I want to! !